(Trent Nelson | The Salt Lake Tribune) Utah Jazz center Rudy Gobert (27) warms up pre-game. Utah Jazz vs Memphis Grizzlies, NBA basketball in Salt Lake City on Friday Nov. 2, 2018. Rudy Gobert came into Friday’s game against Memphis with a double-double in all seven games thus far, and had three straight contests of at least 20 points and 10 rebounds. He started the night averaging 18.3 ppg on 75 percent shooting. The Grizzlies were determined to change that. Memphis is known for playing a “drop-big” defensive system that limits opportunities inside and forces opponents to win via 3-pointers or from the midrange. 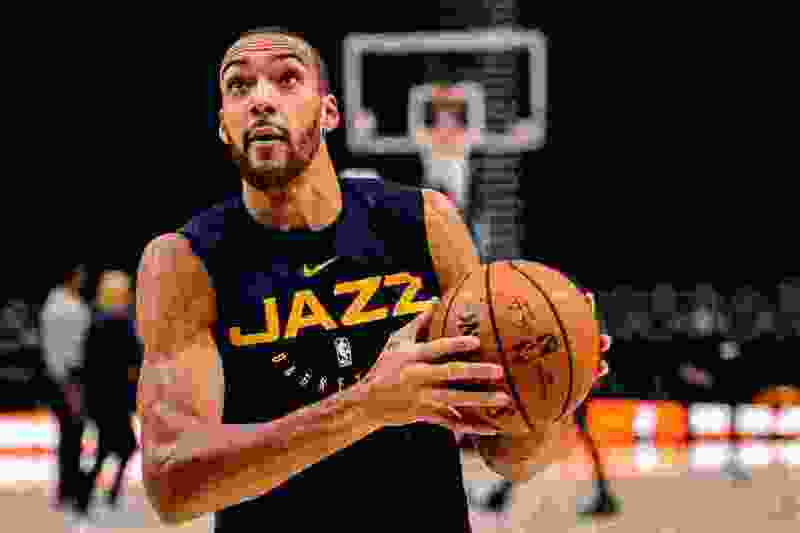 Grizzlies coach J.B. Bickerstaff said that while he tries not to alter his system too fundamentally for any specific opponent, his players were definitely cognizant coming in of the success Gobert and the Jazz are having as a result of all the high passes they throw his way. Gobert’s Memphis counterpart, Marc Gasol, was complimentary of the other Jazz players for getting Gobert more involved this year. In the teams’ first meeting on Oct. 22, Gobert scored just 11 points on 4-for-6 shooting. In the first half Friday, the big man had three points, on 1 for 1 from the field (on a rebound putback) and 1 for 2 from the line. Gobert finished with nine points (on 3 for 5 from the field and 3 for 6 from the line) and 16 rebounds. No Donovan … no problem? With Donovan Mitchell sitting out the game due to hamstring tightness, there were legitimate questions about how the Jazz would replace the 23.3 ppg he came in averaging this year. Grayson Allen got the start in his place, but coach Quin Snyder acknowledged that it wouldn’t be up to the Duke rookie alone, and that the team would lean on its vaunted depth. “We need whoever is in the game to compete and not overthink what their specific roles are relative to tonight’s game and just do the things that they can do,” Snyder said. Bickerstaff acknowledged that while not having a player of Mitchell’s ability available was a setback for Utah, he said the Jazz were uniquely positioned to overcome it for a night.